Nucleic acids RNA (left) and DNA (right). The Swiss scientist Friedrich Miescher discovered nucleic acids (DNA) in 1868. [notes 1] Later, he raised the idea that they could be involved in heredity. 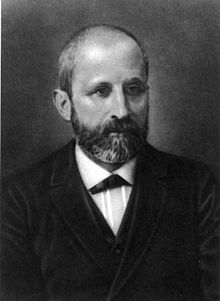 Nuclein were discovered by Friedrich Miescher in 1869. In the early 1880s Albrecht Kossel further purifies the substance and discovers its highly acidic properties. He later also identifies the nucleobases. In 1938 Astbury and Bell published the first X-ray diffraction pattern of DNA. In 1953 Watson and Crick determined the structure of DNA. Experimental studies of nucleic acids constitute a major part of modern biological and medical research, and form a foundation for genome and forensic science, and the biotechnology and pharmaceutical industries. Double-stranded nucleic acids are made up of complementary sequences, in which extensive Watson-Crick base pairing results in a highly repeated and quite uniform double-helical three-dimensional structure. In contrast, single-stranded RNA and DNA molecules are not constrained to a regular double helix, and can adopt highly complex three-dimensional structures that are based on short stretches of intramolecular base-paired sequences including both Watson-Crick and noncanonical base pairs, and a wide range of complex tertiary interactions. Nucleic acid molecules are usually unbranched, and may occur as linear and circular molecules. For example, bacterial chromosomes, plasmids, mitochondrial DNA, and chloroplast DNA are usually circular double-stranded DNA molecules, while chromosomes of the eukaryotic nucleus are usually linear double-stranded DNA molecules. Most RNA molecules are linear, single-stranded molecules, but both circular and branched molecules can result from RNA splicing reactions. The total amount of pyrimidine is equal to the total amount of purines. The diameter of the helix is about 20A. One DNA or RNA molecule differs from another primarily in the sequence of nucleotides. Nucleotide sequences are of great importance in biology since they carry the ultimate instructions that encode all biological molecules, molecular assemblies, subcellular and cellular structures, organs, and organisms, and directly enable cognition, memory, and behavior (see Genetics). Enormous efforts have gone into the development of experimental methods to determine the nucleotide sequence of biological DNA and RNA molecules, and today hundreds of millions of nucleotides are sequenced daily at genome centers and smaller laboratories worldwide. In addition to maintaining the GenBank nucleic acid sequence database, the National Center for Biotechnology Information (NCBI, https://www.ncbi.nlm.nih.gov) provides analysis and retrieval resources for the data in GenBank and other biological data made available through the NCBI web site. Artificial nucleic acid analogues have been designed and synthesized by chemists, and include peptide nucleic acid, morpholino- and locked nucleic acid, glycol nucleic acid, and threose nucleic acid. Each of these is distinguished from naturally occurring DNA or RNA by changes to the backbone of the molecules. ^ "What is DNA". What is DNA. Linda Clarks. Retrieved 6 August 2016. ^ Bill Bryson, A Short History of Nearly Everything, Broadway Books, 2015.p. 500. ^ Cox M, Nelson D (2008). Principles of Biochemistry. Susan Winslow. p. 288. ISBN 9781464163074. ^ "DNA Structure". What is DNA. Linda Clarks. Retrieved 6 August 2016. ^ Lander ES, Linton LM, Birren B, Nusbaum C, Zody MC, Baldwin J, et al. (February 2001). "Initial sequencing and analysis of the human genome" (PDF). Nature. 409 (6822): 860–921. Bibcode:2001Natur.409..860L. doi:10.1038/35057062. PMID 11237011. ^ Budowle B, van Daal A (April 2009). "Extracting evidence from forensic DNA analyses: future molecular biology directions". BioTechniques. 46 (5): 339–40, 342–50. doi:10.2144/000113136. PMID 19480629. ^ Elson D (1965). "METABOLISM OF NUCLEIC ACIDS (MACROMOLECULAR DNA AND RNA)". Annual Review of Biochemistry. 34: 449–86. doi:10.1146/annurev.bi.34.070165.002313. PMID 14321176. ^ Dahm R (January 2008). "Discovering DNA: Friedrich Miescher and the early years of nucleic acid research". Human Genetics. nih.gov. 122 (6): 565–81. doi:10.1007/s00439-007-0433-0. PMID 17901982. ^ Aparadh, V. T. & B. A. Karadge (2012). "Infrared Spectroscopic Studies in Some Cleome species" (PDF). ISSN 2319-8877. ^ a b Brock, Thomas D.; Madigan, Michael T. (2009). Brock biology of microorganisms. Pearson / Benjamin Cummings. ISBN 0-321-53615-0. ^ Hardinger, Steven; University of California, Los Angeles (2011). "Knowing Nucleic Acids" (PDF). ucla.edu. ^ Todorov TI, Morris MD (April 2002). National Institutes of Health. "Comparison of RNA, single-stranded DNA and double-stranded DNA behavior during capillary electrophoresis in semidilute polymer solutions". Electrophoresis. nih.gov. 23 (7–8): 1033–44. doi:10.1002/1522-2683(200204)23:7/8<1033::AID-ELPS1033>3.0.CO;2-7. PMID 11981850. ^ Margaret Hunt; University of South Carolina (2010). "RN Virus Replication Strategies". sc.edu. ^ McGlynn P, Lloyd RG (August 1999). "RecG helicase activity at three- and four-strand DNA structures". Nucleic Acids Research. 27 (15): 3049–56. PMC 148529. PMID 10454599. ^ Rich A, RajBhandary UL (1976). "Transfer RNA: molecular structure, sequence, and properties". Annual Review of Biochemistry. 45: 805–60. doi:10.1146/annurev.bi.45.070176.004105. PMID 60910. ^ Watson JD, Crick FH (April 1953). "Molecular structure of nucleic acids; a structure for deoxyribose nucleic acid". Nature. 171 (4356): 737–8. Bibcode:1953Natur.171..737W. doi:10.1038/171737a0. PMID 13054692. ^ Ferré-D'Amaré AR, Doudna JA (1999). "RNA folds: insights from recent crystal structures". Annual Review of Biophysics and Biomolecular Structure. 28: 57–73. doi:10.1146/annurev.biophys.28.1.57. PMID 10410795. ^ "Database resources of the National Center for Biotechnology Information". Nucleic Acids Research. 42 (Database issue): D7–17. January 2014. doi:10.1093/nar/gkt1146. PMC 3965057. PMID 24259429. * Palou-Mir J, Barceló-Oliver M, Sigel RK (2017). "Chapter 12. The Role of Lead(II) in Nucleic Acids". In Astrid S, Helmut S, Sigel RK. Lead: Its Effects on Environment and Health. Metal Ions in Life Sciences. 17. de Gruyter. pp. 403–434. doi:10.1515/9783110434330-012.